Watch rich, crisp HD video. Run multiple compute-intensive applications seamlessly. We call it the new AMD FX 4-Core Processor Black Edition and it’s unlocked for your overclocking pleasure. Experience unmatched multitasking and pure core performance with the industry’s first 32nm 8-core desktop processor featuring the all-new “Bulldozer” architecture. Get the speed you crave with AMD Turbo CORE Technology to push your core frequencies to the limit when you need it most. Go beyond the limits of maximum speed with easy-to-use AMD OverDrive™ and AMD Catalyst Control Center™ software suites. But the best part of all? You’ll get all this impressive performance at an unbelievable price. You’ll be asking yourself “what competition?” in no time. The one and only AMD FX 4-Core Processor Black Edition comes unlocked and overclockable with easy-to-use AMD OverDrive™ and AMD Catalyst Control Center™ software suites. If you thought you were fast, you haven’t seen anything yet. 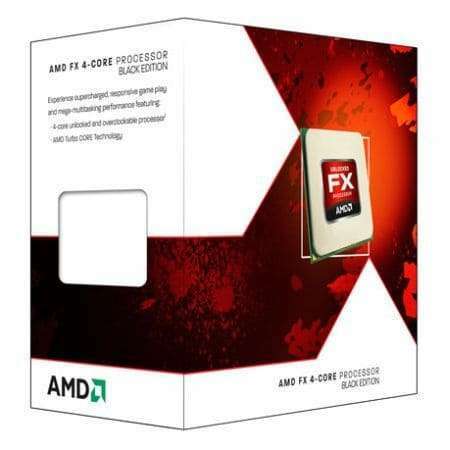 The groundbreaking AMD FX 4-Core Processor Black Edition comes unlocked. No premium to pay. No code to input. Just unrestrained, overclocked power?right away. Experience the world’s first 32nm 4-core desktop processor and AMD Direct Connect Architecture, allowing for unmatched multitasking and dynamic, pure core performance. Experience the industry’s first and only native 4-core desktop processor for unmatched multitasking and pure core performance with all-new “Bulldozer” architecture. • Price and performance. The best of both worlds. Get the speed you crave with AMD Turbo CORE Technology, and outmaneuver the competition with maximum power available from every core configuration. • More bang for your buck. Need aggressive performance for intensive applications? Then you’re in luck. Get superior performance at a competitive price with unlocked technology; you’ll be asking yourself “what competition?” in no time. • Unlocked technology. Unbelievable pricing. Maximize your efficiency with more speed and overall performance for a remarkable price that amazes the competition. And with AMD Turbo CORE Technology, push your core frequencies to the limit when you need it most.